LTTR is a feminist genderqueer artist collective with a flexible project oriented practice. LTTR produces an annual independent art journal, performance series, events, screenings and collaborations. 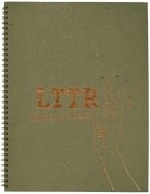 The group was founded in 2001 with an inaugural issue titled “Lesbians to the Rescue,” followed by “Listen Translate Translate Record,” “Practice More Failure,” “Do You Wish to Direct me?,” and most recently "Positively Nasty" LTTR is dedicated to highlighting the work of radical communities whose goals are sustainable change, queer pleasure, and critical feminist productivity. It seeks to create and build a context for a culture of critical thinkers whose work not only speaks in dialogue with one another, but consistently challenges its own form by shifting shape and design to best respond to contemporary concerns.